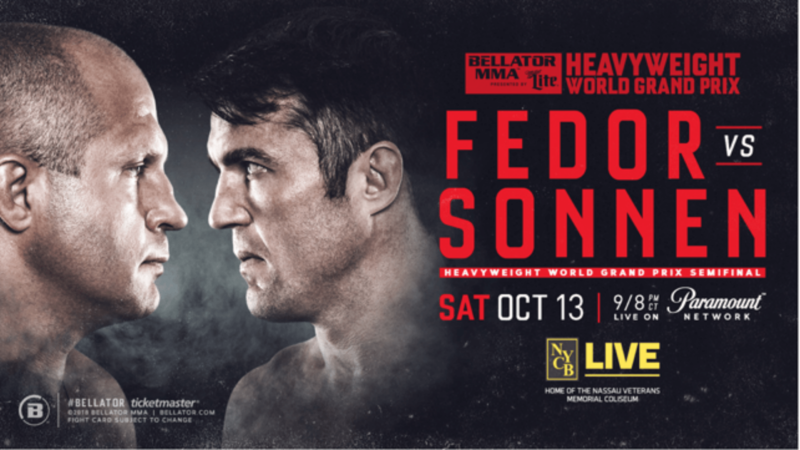 Chael Sonnen couldn’t wait until his Bellator 208-headlining fight against Fedor Emelianenko on October 13. “The American Gangster” just had to get a piece of “The Last Emperor” right away. So, when a conference room glass door of Paramount’s Network’s Downtown Manhattan, New York offices slowly slid open Tuesday, Sonnen proceeded to press and assault Emelianenko … with questions. “Have you met [Russian wrestling legend and three-time Olympic gold medalist Aleksandr] Karelin?” Sonnen politely hijacked Sporting News’s interview with Emelianenko to ask his opponent out of pure curiosity. “Yes, I met him many times,” Emelianenko replied through a translator. “But not trained [together]?” Sonnen shot right back, inching forward in a conference room chair. “No, not trained,” Emelianenko said. A few minutes later and Sonnen continued to pepper Emelianenko with hot-button questions as if they were stinging punches. After explaining that Nurmagomedov will be able to take McGregor down, Emelianenko suddenly said in English, “I don’t like Conor,” drawing a laugh from Sonnen, before he excused himself from the room. The improbable scene between the future opponents made two points clear: Sonnen has gotten ultra comfortable — and really good at — bringing the conversation, as evidenced on Ariel and the Bad Guy podcast with MMA journalist Ariel Helwani. That, and the cordial factor between Sonnen and Emelianenko will obviously take a violent turn when the two meet in Bellator’s Heavyweight World Grand Prix semifinal matchup in less than three months at NYCB Live Nassau Veterans Memorial Coliseum on Long Island, NY. The bout will air on the Paramount Network and stream on DAZN. That being said, while Sonnen knows the “fighter” Fedor, he claims to not know anything about the person. To that, Emelianenko couldn’t care less. “No, [I don’t care about that],” he told Sporting News through a translator, while flashing a big grin. What the pair of 41-year-olds could agree about, however, is sticking to what they know training-wise, while also adding in new wrinkles. How do you see their October 13th fight panning out? – Sonnen’s last two wins came against Quinton Jackson and Wanderlei Silva. Considering that Jackson and Silva are fighting for the fourth time on September 29, Sonnen wouldn’t make a prediction, but did say, “I’d be stunned if it went out of the second round.” Us, too.